Blusteele HEAVY DUTY Clutch Kit for Holden Monaro HQ LS 202ci Red Motor 1971-74. 220mm clutch plate X 10Tooth X 29.0mm. You Will receive a clutch kit including. Heavy duty Clutch Pressure Plate Cover assembly. Heavy Duty Organic Clutch plate. 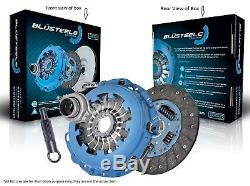 Blusteele Heavy duty clutch kit advantages. This is a Heavy Duty Clutch kit d esigned and manufactured to exceed the original clutch system installed as Original Equipment. Each component has been thoroughly tested and developed to provide a Quality Assured. Replacement part that will meet or exceed the requirements of an original vehicle. This is a genuine Heavy duty clutch kit, great for Towing and moderate 4 X 4 applications, also great as a premium clutch kit for everyday vehicles. All Pictures are for illustration purposes only. We will try and beat any price. (Mon - Fri 9.00-4.30 est). Send through your VIN number for an accurate check on your vehicles clutch kit. We know youre keen to receive your order as quickly as possible. We take care to pack every item securely to so it reaches you in brand new condition. Your order will be sent through Australia Post or one of our preferred couriers. All consignments are fully tracked. We strongly recommend you use eBays Shopping Cart for multiple item orders. And we will do our best to make sure youre happy. Some manufacturers prefer that end users deal directly with them, and others prefer to work through us. And well make sure the correct process is followed so the issue can be addressed as quickly as possible for you. Each product we sell comes with automatic guarantees that cannot be excluded under Australian law. For exchanges, we will cover the cost of sending a replacement product back to you. The item arrived damaged or missing parts. All orders leave our warehouse in brand new undamaged condition. It is important that you open your order as soon as you get it, and notify us immediately if there is any damage. So we can report it to our insurer, carrier and warehouse. We will get back to you asap. The item "Blusteele HEAVY DUTY Clutch Kit for Holden Monaro HQ LS 202ci Red Motor 1971-74" is in sale since Tuesday, November 14, 2017. This item is in the category "Vehicle Parts & Accessories\Car & Truck Parts\Transmission\Clutches".